A dish fit for the royalty. Mutton Maharaja literally translates to “the meat prepared for the king”, and true to it’s name, this recipe is of royal origins. 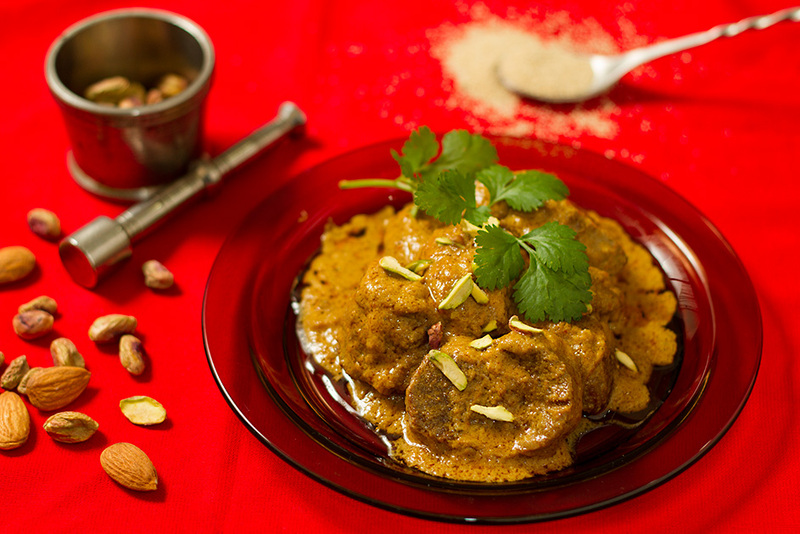 Infused with aromatic herbs, dry fruits and saffron, this melt in mouth mutton dish is a treat to be leisurely enjoyed with the entire family on a winter weekend. Though if you want to garner praises for your culinary skills, make this for select guests and watch them relish it. While this recipe is very easy to prepare if you follow the method, you need to take care that the gravy does not stick to the pan. Adding a little extra water during the pressure cooking process helps in reducing the chances of burning the gravy. Melt 2 Tbsp ghee and fry onions, ginger, garlic, green and red chilies until onions are just soft. Remove from heat, allow to cool and run it through the blender along with the yogurt. Keep aside. Heat the remaining ghee, reduce heat and add black cumin seeds, ground coriander, garam masala, turmeric and black pepper powder. Add the ground poppy seeds. Add washed mutton and fry until the meat changes colour. Cover and allow the meat to cook for a while in it's own juices stirring occasionally till you see the fats floating. Fry for a few minutes more taking care not to burn the mutton and masalas. Add the blended ingredients and mix thoroughly. Rinse out the blender with warm water and add to the meat. Stir in salt Add 1.5 cups of warm water and in the pressure pan this takes about 25 minutes after the first whistle. After the pressure releases, stir in the ground almonds, half the coriander leaves and cook uncovered for about 5 minutes while the gravy thickens. Stir frequently so that the thick gravy does not burn at the bottom of the pan. Remove from heat, add lemon juice and garnish with pistachios and remaining coriander leaves. Mutton Maharaja tastes best with roomali roti but you can also serve it with home made parathas and zeera rice. i tried it with chicken that was also too gud…. Extremely tempting recipe, I’ll definitely try.